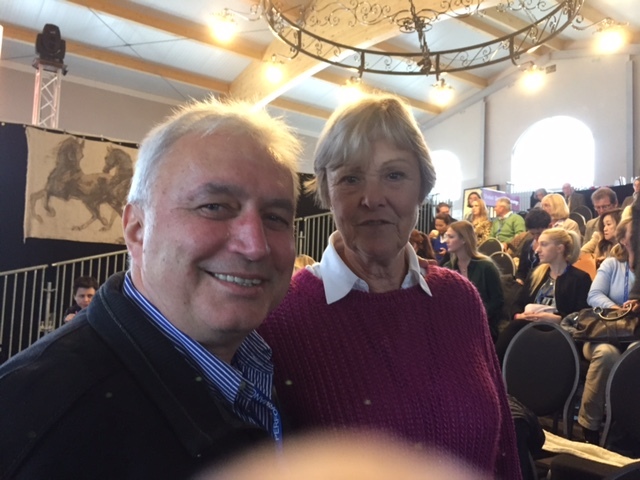 This year the Global Dressage Forum was held in Hagen, in Germany by the kind invitation of Ullrich Kasselmann. It was a great setting with the hills behind it. Set among the grounds were several barns of horses, over two hundred in fact. Between the paddocks were indoor schools and working arenas. 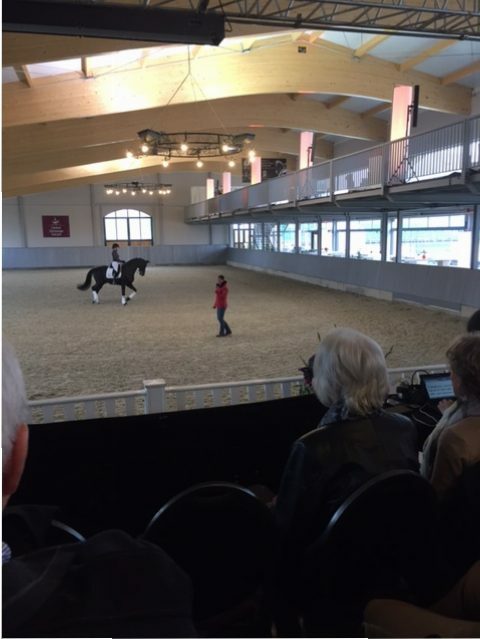 The main arena which is used for show jumping, has a new indoor school alongside it with grandstands and galleried viewing areas. Richard Davidson and Kai Vorberg chaired the two days, which was well supported. The subjects covered were diverse, starting with a discussion on how to finance the shows, which are extraordinarily expensive to run. Competitors are not always helpful as they do not attend functions or parties at the shows which are laid on to encourage the sponsors. It was suggested that celebrities were needed in the sport to attract the public to watch television coverage. Not all agreed. We were given a double long reining demonstration by the true horse man, Frankie Slootaak. He felt that horses should be made fit to carry riders, from an early age so they were strong enough when the saddle was put on. He likes his horses ridable and handle friendly. The horses respect him and trust him and he respects them. He was able to bring the horse to an instant halt, where is stayed patiently still whilst he spoke to us. There was a great display by a medal winner from all the young dressage stars from Under 25’s to the gold medallist pony ridden by Anouk Baumgurtel. The second day started with us all joining Jessica von Bredow-Werndl in the indoor school to do our stretching and loosening yoga exercises Some were better than others!! The indoor school floor was a mattress of hard foam rubber covered by fibre sand. It felt great. A talk about keeping the horse’s vascular system healthy followed by stories of Rio, all good. David Hunt and Uwe Mechlem explained the job of the Judging Supervisory Panel, and we learnt about the Bereiter training. Finally, we were able to watch the top German riders working horses. Christina Broring-Sprehe on Desperado, who is quite a character to organise at shows, the masterful Hubertus Schmidt, Isabell Werth showed us her new Verden buy, a lovely chestnut mare, and finally Dorothee Schneider rode a new part trained horse. We were shown young horses that were about going through the psi sales doing half steps with Johannes Augustin and some sold through the Auction that were on their way in the competition world. We all had fun catching up with friends and increasing our knowledge on the way. « THE LEGS	» A New Year Begins.